Spring is heading toward summer. The birds and the bees are getting active. Where do you get ideas to help plan a wedding? From 11:00 a.m. to 3:00 p.m. on Sunday, April 30, Fromagination will be available to talk about weddings at Madison’s Edgewater Hotel. Tickets are $25, or 2 for $40. The Everafter wedding show will include a bunch (available through the hotel), speakers and activities…in addition to vendors who can provide advice about wedding planning and events. Details on the wedding expo are here. 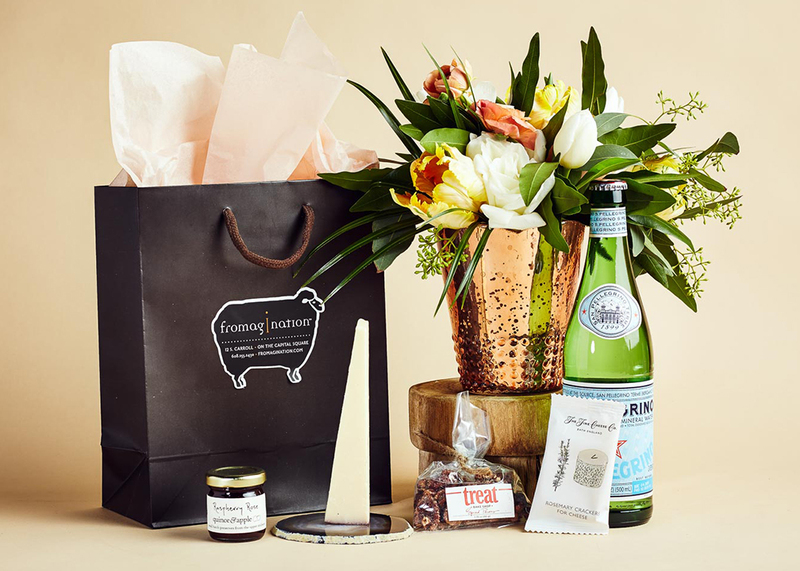 Fromagination’s expanded wedding services will be featured at our booth – including wedding favors, catering services, gifts and cakes of cheese! Other vendors will showcase services including catering, travel, entertainment, wedding planning, flowers, limousines, photography and jewelers. Tickets for the wedding expo can be purchased here. If this Sunday is already booked for you, and you want more information about Wisconsin artisan cheese for your big day, give Shannon a call at our shop: 608-255-2430. We hope your celebration is joyful!…and well-planned. ← Is Cheese on Your Bucket List?